Great authors use dialogue to reveal the hearts and minds of their characters, to create conflict and humor, to fuel action, and to rivet readers' attention. They know that readers typically form their first impression of a story from its dialogue — more so than from plot or action. And they work to bring the utmost realism to the words their characters speak and think. How do they do it? This intensive webinar, written and presented by instructor and award-winning novelist Elizabeth Sims, will give you the same tools the pros use to craft terrific dialogue. She'll start by unlocking the great paradox of dialogue: Authors must write dialogue that comes across as real and believable, yet why does actual speech usually sound so dumb when transcribed onto the page? She'll cover the basics of good dialogue, then move into the nuts and bolts of generating ideas for dialogue, how to use characters' words—instead of narrative—to bring them to life and how to stay out of trouble when writing tricky passages. It takes skill to craft a story with believable dialogue. Whether you're looking to learn the basics of writing dialogue from styles of grammar and punctuation to techniques for writing internal dialogue for your characters' private thoughts, you'll get the best strategies and tools for writing. You'll also explore common problems aspiring writers have when writing dialogue, such as how to break up long passages of dialogue with action or write complex conversations between multiple characters. Plus, if you're a science fiction writer, you'll get tips on dialogue for characters who speak a foreign language or have an accent. 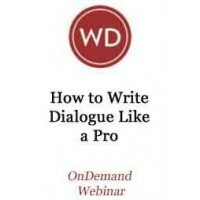 By the end of this webinar, you'll have a solid grasp of how to write dialogue that engages your readers and elevates your writing. Download How to Write Dialogue Like a Pro now and take the advice, devices, and techniques to breathe life into your manuscript's characters and attract the attention your story deserves from agents or editors! Elizabeth Sims is the author of seven popular novels, most recently ON LOCATION: A RITA FARMER MYSTERY (2010, St. Martin's Minotaur). Booklist calls her crime fiction "as smart as it is compelling." Besides the Rita Farmer Mysteries, she's the author of the Lambda Award-winning Lillian Byrd Mysteries. Elizabeth is also a contributing editor at Writer's Digest magazine, where she specializes in the art and craft of fiction. She holds degrees in English from Michigan State University and Wayne State University (where she won the Tompkins Award for Graduate Fiction), and she loves to help fledgling authors find their wings.